Zoom! Teeth Whitening Winthrop | Cosmetic Dentist | Brooks Dental, P.C. 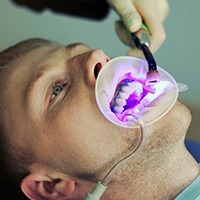 Looking to have a whiter, brighter smile? In today's world, you've probably seen all kinds of methods that claim they'll accomplish this. However, if you're not interested in investing several weeks of treatments, dealing with cumbersome mouth trays and achieving relatively limited shade improvements, consider the revolutionary, safe, and easy "ZOOM!®" process from DISCUS Dental. With just a one-hour treatment session, our ZOOM!® whitening system can lighten your teeth without sensitivity problems and with long-lasting results! Why Choose Brooks Dental for Teeth Whitening? 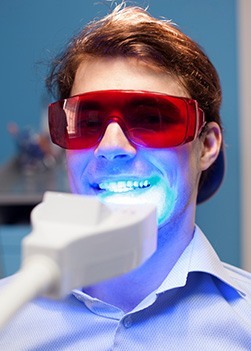 If you're interested in having your smile brightened, we recommend that you first talk with us regarding your specific goals so that we can evaluate how teeth whitening might impact your particular situation. Some people are simply better candidates than others for a successful whitening treatment. For example, if your teeth are darkened to a yellow, brown or orange tinge due to age, coffee, tea or smoking, chances are very good that teeth whitening will bring satisfactory results. However, if your teeth are a dark gray tone from fluorosis, smoking or tetracycline use, whitening results may be a bit less dramatic; plus, whitening does not lighten artificial materials such as resins, silicants, or porcelains. Finally, teeth with periodontal disease or worn enamel typically do not respond well to whitening. And in any case, after whitening, your new, brighter smile will be preserved the longest if you're willing to forgo such habits as smoking, drinking coffee and drinking tea.